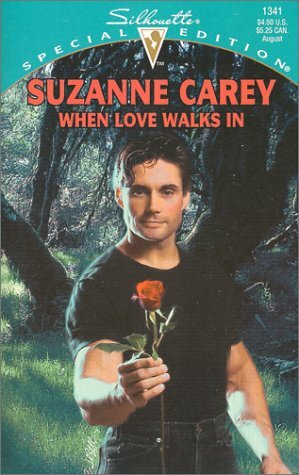 This review of When Love Walks In by Suzanne Carey was first published at The Romance Reader in 2000. I rated it 4-Hearts (B rating) and gave it a sensuality rating of PG-13. When Cate McDonough was 17 years old she fell hopelessly in love with misunderstood Daniel Finn. Everyone in small town Beckwith, Ohio, thought Danny was no good, including Cate’s parents. Even though they had forbidden her to see him, she continued to do so. In fact, Cate and Danny were so crazy for each other they planned to elope. Of course, their elopement didn’t go according to plan, and Cate’s parents caught up with them. The marriage was annulled and Danny left town for good, leaving Cate behind. When she discovered she was pregnant, her parents convinced her to marry local boy Larry Anderson and pass the baby off as his. The two wed quickly, and moved to Minneapolis. Fast forward 17 years and Cate is a young widow with a teenage son. She has lied about Brian’s age since his birth to cover up the fact that Daniel Finn is his biological father. She has since moved back to Beckwith and is a high school English teacher. When she learns that Danny is back in town, her world and her fragile lies are placed in jeopardy. Danny is now a powerful executive working for the corporation that bought Beckwith Tool and Die. It’s his job to recommend to the corporation whether or not to expand operations at the current site or move to a different location. The plant is the town’s main source of support, even employing Cate’s father. It’s feared that Danny will destroy the very town that scorned him as a youth. But Danny’s reason for taking the assignment is to see Cate. He was devastated by her marriage to Larry, and wants some answers. Will Cate and Danny be able to work past their misunderstandings and renew their love? Will Cate tell him about Brian? How will Brian react if he learns the truth? The child-he-never-knew-he-had story has been around the block more than a few times by a variety of authors. Carey takes a familiar story and infuses it with such angst and heartache, that I immediately was sympathetic to Cate’s plight. I understood the choices she had to make once Danny was out of her life and she found herself alone, pregnant, and a prisoner in her own home. There were parts of this story that initially nagged at me, especially Cate’s relationship with her parents. Her father emotionally and verbally abuses her at every turn, and her mother is too weak to go against her husband’s tirades. As I was asking myself, why does Cate continue to associate with these people? - Carey offers up a wonderful explanation. And when I thought I was going to have to endure a spineless heroine who wouldn’t stand up for herself against a bully father - Carey gives her a spine. There are several moments where Cate fights back with her own verbal punches, and it had this reader standing up and cheering for her. The ease in which Cate and Daniel resume their relationship was a bit hard to get past. Seventeen years is an eternity in my mind, and while Cate does hesitate a bit, Daniel jumps right in. However, it is a terribly romantic concept for first loves to be reunited even after all the struggles they have endured, and it was this notion that allowed me to sit back and enjoy the ride. Readers who enjoy secret child and lovers forced apart stories will love to sink their teeth into this one. Daniel and Cate resuming their teenage love affair, Cate’s struggle with the truth and the people it would hurt, plus her heated battles with her father pulled at this reader’s heartstrings. An emotional read that will have more than a few readers grabbing for the Kleenex. Wendy Looks Back: I cannot say for certain but this may have been my first ever category romance read. If it wasn't the first? It's pretty darn close. I remember really liking it, and it is one instance where I recall the secret baby plot working well for me. It's funny what sticks with me sometimes. Prior to rereading my review I recalled a few things about this book: 1) the author's name 2) secret baby plot and 3) that cover. Seriously, how EPIC is this cover art? It's literally been seared into my brain since 2000. Carey has a long category backlist dating from the late 1980s to 1990s. This book appears to have been her last published work - now 14 years ago.